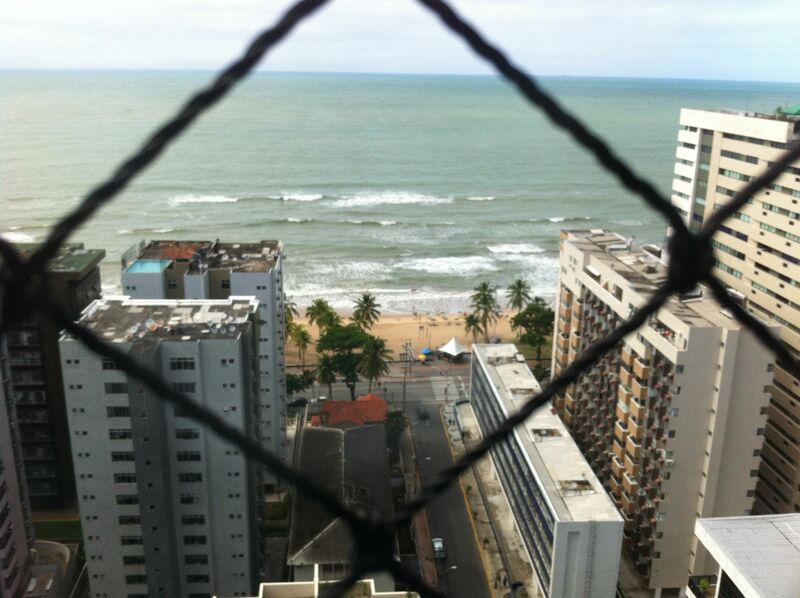 The view of Boa Viagem Beach from our apartment. James and I arrived in Recife, Brazil on a Saturday shortly after lunch. One of James’ co-workers met us at the airport and brought us to our new apartment. As we drove through the city my first feeling was intimidation. I immediately wondered what I had gotten myself into. It was loud and busy with cars cutting each other off and children asking for change in the street. Everything seemed very urban and I understood straightaway the huge gap between classes here. Once we settled in, and explored what may be the smallest space we’ve ever lived in, we had plenty of time left in the day. Every fiber of my being wanted to stay in the apartment and create some sort of comfort zone. Thank goodness James is more adventurous in these situations. It didn’t take much coaching to get me moving, partly because I was hungry and we had no food in the kitchen and partly because I was curious about this new city. We are in an area called Boa Viagem and are just one block from the ocean so that’s the first place we headed. It is very nice with wide a sidewalk housing stands that serve snacks and drinks. There are also playgrounds and a bike path. All in all it seems like a very family-friendly area. After walking several blocks in each direction it became apparent that restaurants are not abundant near the beach. We did see a small Coca-Cola themed store with a grill in it so stopped in for a bite to eat. It is times like these that I wish I ate beef because a hamburger is so easy to order regardless of what country you’re in. Needless to say, that’s what James had. I pointed to a case of pastries that seemed to be filled with meat and said “frango” which is the Portuguese word for chicken. I was given triangle-shaped dough filled with minced chicken and cheese. It tasted old as if it had been sitting for awhile so I didn’t finish it. After dinner we headed away from the beach and found that several pharmacies and gas stations are near our apartment building. We looked around and bought a couple of things for our new place. By the end of the day I felt much better about my surroundings and was ready to learn more the next day. Sunday we decided to check out the nearby mall fittingly called Shopping Recife. It is the biggest mall in Recife and one of the biggest in Brazil. Unfortunately, it’s also a 30 minute walk from our apartment and the sidewalks are in very poor condition. The trek was well worth it, however. Shopping Recife is very modern with several restaurants and cafes dotted throughout. We enjoyed strolling through the different shops and were amazed by the variety of stores. There were luxe specialty shops mingled with huge super centers selling everything from appliances to shoes and electronics (the Brazilian equivalent of like a Wal-mart). After leaving the mall our goal was to find a grocery store of some sort. We finally did and were able to get some staples for the apartment along with some new things we’d never tried before. The toughest thing about the whole weekend was the language barrier. In two days James and I had not encountered one person who spoke English. I have been to nine countries now and while I have been in situations where my English was not understood I never had to go far to find someone whom I could speak with. I am making an effort to better learn the language. Right now all I know is basic pleasantries and how to order food. What I have learned in only two days has made me hopeful about my future here but there is a long way to go. The good think about this blog is that I am not a seasoned traveler (yet) so I’m learning as I go and sharing that with my readers. You all get to be a part of my confusion, fear and triumphs as I figure everything out. Stay tuned. There is definitely more to come!